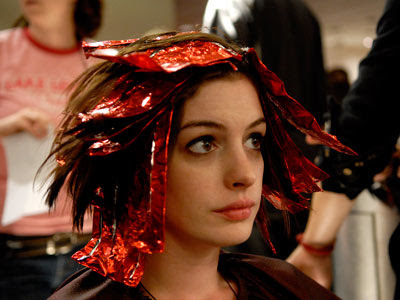 Kym (Anne Hathaway) is an ex-junkie just out of rehab who is returning to her family home in time for the wedding of her sister, Rachel (Rosemarie DeWitt). Things start off cordially enough but it doesn’t take long for the outspoken Kym to dredge up the past and cause old grudges, animosities and family tragedies up to the surface. I hate weddings. If you want a sure-fire way to cause all the joy and happiness to drain from my face, tell me I’ve got to go to a friend or a family member’s wedding. Don’t get me wrong, I have nothing against marriage, but the actual matrimonial ceremony strikes me as an antiquated pantomime steeped in the worst kind of schmaltz. I am predisposed then to like any film that promises to take a somewhat cynical view of weddings, and the opening 30 minutes of Rachel Getting Married had me thinking that that was what I was going to get; the writing was wry and biting, the staging of the rehearsal dinner was so ludicrously over the top and saccharine that it could only have been satirical, and the ‘home movie’ aesthetic lent a rawness to the family dynamics and barely submerged resentments that were swirling around the big day. Throw in some uncomfortably candid sequences at a 12-Step programme and you’ve got something cooking. Sadly, it can’t last. At roughly the halfway point of the film, the film pretty much abandons this approach, veering into over-cooked melodrama and aimless shouting, culminating in a scene which ranks as one of the most ludicrous scenes I have ever seen in a serious film. Two characters decide to see who can fill up the dishwasher more quickly and efficiently, leading to a sequence that must be at least 5 minutes long in which first one tries to load it and then the other, and which is so obviously building up to an important moment that when it happens, and proves to be so anti-climactic, you can only feel incredulous. It’s just one of several scenes in the film that goes on too long and whose payoff is in no way powerful or interesting enough to actual provoke any response other than outright bafflement. And that’s without even mentioning the absolutely nadir of the whole piece; the wedding itself. The wedding sequence is, hands down, the most interminable piece of celluloid that I have ever seen (I tell a lie, that would be Crazy/Beautiful, the Kirsten Dunst snooze fest that to date is the only film I have ever walked out of). At one point I was bracing myself on the seat in front, head between my legs, wishing for it to end and for all the horrible people on the screen to just go away. It’s so bewilderingly mawkish (the groom sings a Neil Young song after saying ‘I Do’), the supposed catharsis we are meant to feel for the characters is so completely unwarranted and at odds with the darkness that characterised the rest of the film that I was wondering if they’d swapped a reel with Bride Wars, Anne Hathaway’s other current nuptial project. Let me put it this way; before the wedding scene, I was a bit disappointed with the way that Rachel Getting Married had tapered off after the strong first half. After the wedding scene, I hated it. I hated the film, I hated the characters and I hated how it had abandoned the actually interesting aspects of it. It started out as being about how weddings whitewash family problems and falsify emotions, and ended up with all the problems being whitewashed and the emotions being falsified. For me, these weaknesses are all the result of Jenny Lumet’s script, since the other aspects of the film are actually hard to fault. There’s nothing insightful in her depiction of familial relationships, falling back as she does on very tired clichés, and there’s little to get emotionally involved with as the characters are just so terribly unlikeable. I know that likeability should not be the be all and end all of a film, but for me this story needs the characters to be at least a tiny bit sympathetic, otherwise there’s no real tension. The structure of the film is also way off, as if Lumet had come up with the first half then just didn’t know where to go with it, bottling out at the midway point and clumsily wrapping it up at the end. The one shining star in this moribund sky is Anne Hathaway, who is absolutely brilliant as Kym and is pretty much the only reason I can see why the film has gotten such good reviews. That’s not to take away from the rest of the cast; they all perform capably and Rosemarie DeWitt’s performance as Rachel is an under-rated and multi-layered role, but it really is Hathaway who makes the film. She completely deserves her Oscar nomination and, if I wasn’t so strongly rooting for Angelina Jolie to win for Changeling, I’d be backing her all the way. Kym is a bruised and battered ex-junkie who could so have fallen into tired old clichés of self-pity and contriteness. Certainly there are aspects of that in her, she spends much of the film trying to atone for something in her past, but there’s just something so captivating about her. It’s in her self-destructive nature, the way in which she is willing to let herself get drawn into fights, hold grudges and drag up the past; it’s in her honesty, her unwillingness to let things slide and to point out the falsehoods of what’s going on; it’s even in her desire not only to apologise, but to receive forgiveness for it, something which feeds into her antagonistic personality and makes for a fascinating character. It’d be disingenuous of me to not compliment Jonathan Demme’s direction, because it impressed me even if what he was directing did not. The film is shot handheld and is intended to look like a wedding video; Demme has said that he wanted to make the most beautiful home movie ever, and I think that he succeeds. Much of what works in the first half is down to his ability to get across the raw emotions of the characters before everything gets incredibly SHOUTY AND CRYEY in the second half. Even during the second half, he at least maintains the conceit and that’s to be commended. It’s got a great performance and, even during that horrid wedding, Hathaway still manages to charm and entrance, but we should not confuse a great performance with a great film, because Rachel Getting Married is most assuredly not such a thing. It’s a well-made, well acted piece that is really dark, interesting and edgy for the first half, but so badly falls apart in the second that I can’t have anything but disdain for the entire exercise. That Anne Hathaway manages to put her stamp on the film and assert her position as one of the most promising actresses around is not to be sniffed at, but not enough to make me like the mess that surrounds her.